Photos: City of Fort Collins. Fort Collins, Colorado, is the latest city to embrace America’s most underrated type of bike facility. As it works to improve the low-stress biking network in the newer, car-oriented neighborhoods of its northwest, the city of 164,000 has used a tool that can be perfect for quickly, cheaply linking up the biking grid: a neighborhood bikeway. The city held an official ribbon-cutting on Friday. Click to enlarge. Image: Alta Planning + Design. Here’s the biggest challenge to making biking on a side street like Pitkin Street feel like biking on an off-street path: making it much easier to cross the big streets. The obvious answer would be adding traffic signals. But installing a new four-way stoplight is expensive — maybe $150,000 in Fort Collins, which is (believe it or not) low by national standards. Another downside of four-way traffic signals: They tend to attract traffic. If full stoplights led more people to turn onto the Pitkin Bikeway, that’d make biking, walking, and living on the bikeway less pleasant. Instead of rotating through red and green phases automatically, toucan crossings give red lights to the arterial street only when someone on the local street hits a button. Someone on a bike, riding down the middle of the lane on the low-traffic street, crosses a toucan by pulling to the center island and pushing the bike-specific button there. It works like any sidewalk-activated button, except that the green light for crossing bike traffic doesn’t need to last quite as long as for a walking button. Another feature of the toucan crossing: they function like a diagonal traffic diverter, indicating to people driving that the streets are now for right turns only. This has the effect of reducing auto traffic on the local streets — which had already carried fewer than 2,000 cars per day, Greegor said. She said the city hasn’t heard many objections about this lost auto maneuverability, because it had already been hard for cars to cross or turn left at these corners. Alta Planning + Design, a consulting firm that worked with Fort Collins to design the facility, wrote more about why the city chose to use toucan crossings on its blog. Alta’s project manager, Montana-based designer Joe Gilpin, said in an interview that neighborhood bikeways can be a particularly good way for smaller cities to rapidly expand low-stress bike networks. Not only are neighborhood bikeways cheaper per mile than protected bike lanes or off-street paths. They’re also easiest to install in less-dense areas, because the amount of auto traffic is naturally so low that diverters aren’t required. The Pitkin Bikeway hosted Fort Collins Open Streets on Sunday, September 17. The Pitkin Bikeway got a test ride on Sunday from thousands of people who turned out for the city’s annual Open Streets event — intended in part to show off the fact that by calming and reducing auto traffic, a bike route can also create better streets for walking, scooting, skating and generally having fun. But it’s already a model for more streets around town. 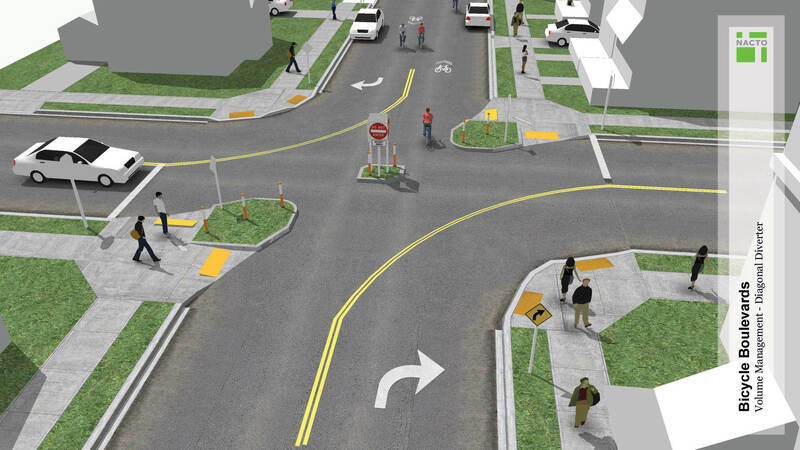 “We’re designing a bunch of other intersections currently that would be installed with toucan crossings,” Greegor said. Next up for Fort Collins are a handful of longtime trouble crossings around the city and the Hampshire Bikeway, a north-south corridor on the western side of town, including four arterial crossings. Another feature of the forthcoming Hampshire Bikeway: intersecting with the Pitkin Bikeway. They’ll be the next two crosslinks in Fort Collins’s low-stress biking network, laced directly into its street grid. PlacesForBikes is a PeopleForBikes program to help U.S. communities build better biking, faster. You can follow them on LinkedIn, Twitter or Facebook or sign up for their weekly news digest about building all-ages biking networks. Amazing, let’s get our cities to join them! Building bikeways only on quiet streets might actually be the worst option, one study says. Fascinating results from a city whose bike network was literally a Communist plot. Most U.S. street design institutions haven’t wanted to say for sure. Until now. In the first in a series of profiles of the 10 focus areas in the PeopleForBikes Big Jump Project, we look at Baltimore's plans to beef up frequent bus service and install a low-stress biking network in six neighborhoods.